A liquid lipstick with a velvet texture & a vibrant, moisturizing, full-coverage matte finish that will last for hours without drying out your lips. Apply matte liquid lip to the middle of lips and work outward. Let dry. Can be worn alone or in combination with lip pencil. What is Molly gets matte? What colors does molly gets matte come in? HOW MUCH DOES molly gets mattE COST? How does molly gets matte work? Molly Matte is a liquid lipstick that goes on light and stays on long, leaving your lips smooth and moisturized. Apply one layer or multiple to build more pigment. WHAT INGREDIENTS ARE IN molly gets matte? WHAT IS molly gets matte’s NET WEIGHT? TELL ME WHAT MAKES molly gets matte SO AMAZING? WHAT ARE THE BENEFITS OF molly gets matte? 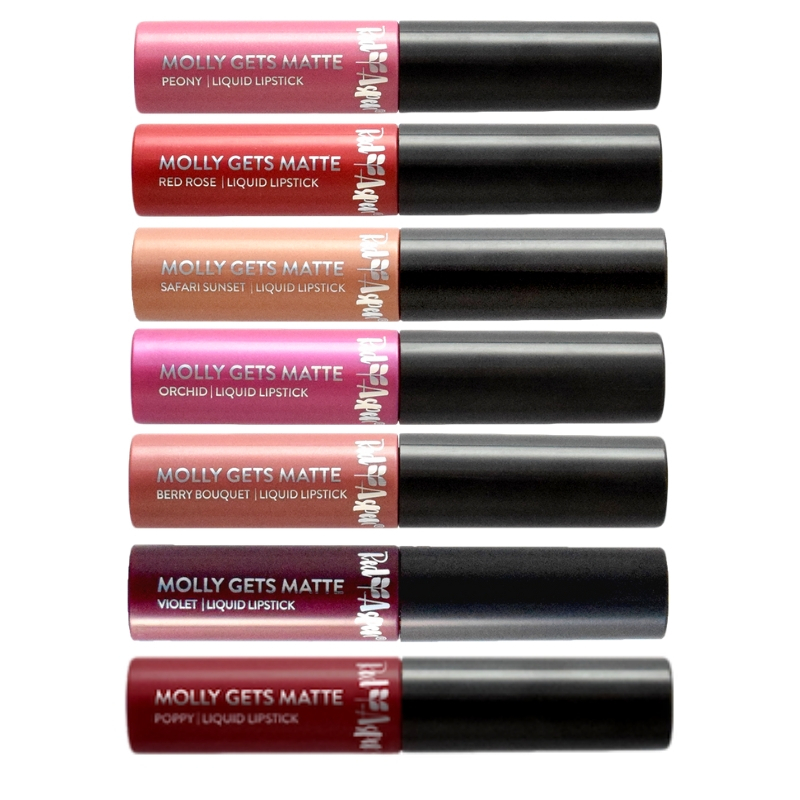 Is the Molly Gets Matte Liquid Lipstick scented? Molly Gets Matte Liquid Lipstick is unscented. IS Molly Gets MAtte PV ELIGIBLE? CAN YOU ADD Molly gets matte TO YOUR LOYALTY BOX? WHAT IS THE LIP KIT? Each Red Aspen Lip Kit includes a Contour with Grace Lip Pencil and a matching Molly Gets Matte Liquid Lipstick. Molly Gets Matte is a liquid lipstick with a velvet, creamy texture and full-coverage matte finish that won't dry out your lips. Contour with Grace is a long-lasting, highly pigmented lip pencil with a built-in blending brush that can be used to line, fill, and contour your lips for an intensely pigmented finish - you can learn more about it on the Contour with Grace Lip Pencil page. HOW MUCH IS THE LIP KIT? IS THE LIP KIT AVAILABLE TO BOTH BRAND AMBASSADORS AND CUSTOMERS? Yes, the Lip Kit is available for purchase by both Brand Ambassadors and customers. WHERE CAN I PURCHASE THE LIP KIT? The Lip Kit is available on YOUR Brand Ambassador's business page and www.redaspenlove.com for $27. CAN YOU ADD THE LIP KIT TO YOUR LOYALTY BOX? No, however both the individual Contour with Grace Lip Pencil and Molly Gets Matte liquid lipstick can be added individually to your Loyalty Box.